My Marathon plan worked. Early in my training, I put my goal on Facebook and announced that I was not alone in my Marathon comeback. My goal was that putting it out there like that would hold me accountable, almost force me to train hard to finish the Marathon. Never was my FB catchphrase more accurate than on Marathon weekend. The outpouring of well wishes via texts, FB messages, videos, pictures, calls etc. overwhelmed me. I took all of that support with me as I plodded along the 26.2 mile course. Speaking of that course, several members of my family and friends busted their butts and met me at many spots along the way. Seeing these familiar faces and hearing them encourage me helped me block out the pain and move onward. Having this sort of support is very powerful. It is uplifting and moving. It is the greatest feeling in the world. Yes, it is even better than the feeling of crossing that Finish Line. However, crossing that Finish Line with them there is just the best. I can never express my gratitude and love enough. At least I am publicly putting it out here and telling the world that I have the best friends and family. I was not alone in this...and I am never alone! Love you all. 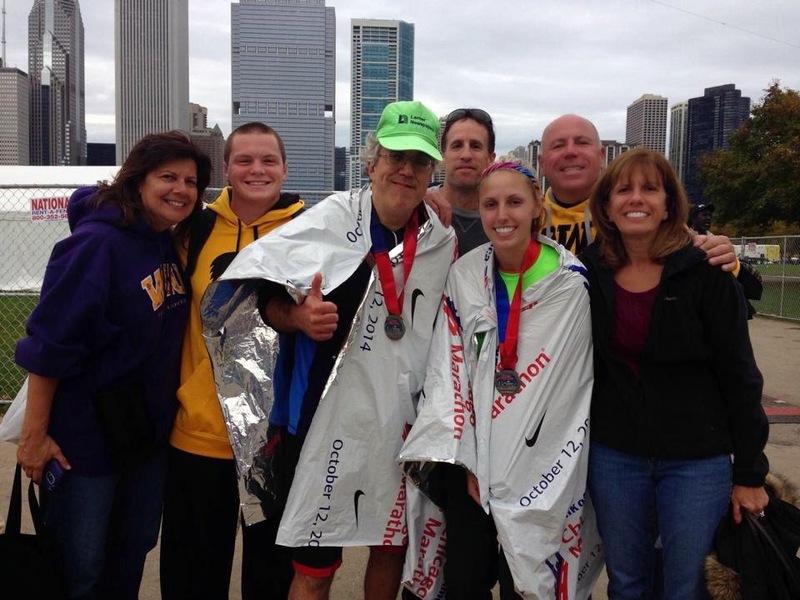 Nancy, Kyle, me, Lou, Sam, Scott and Jean in Chicago, IL-October 2014. I am so glad to say I have the best brother a girl would ever need. Love you more!